Science classes are as old as academia, but a program at the UO is helping science instructors hone some new tricks to engage nonscience majors in their courses. 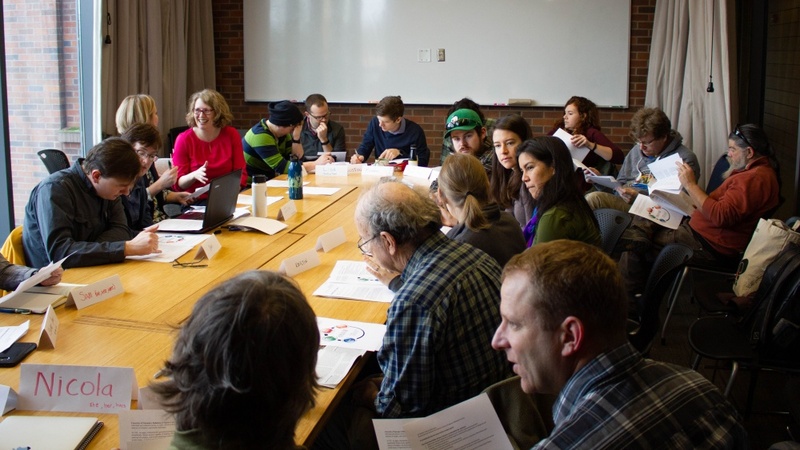 The University of Oregon’s Science Teaching Journal Club is a partnership between the Science Literacy Program and the Teaching Engagement Program. It brings faculty members and students together to discuss strategies and methods for engaging more students in science, technology, engineering and math courses. Unlike most journal clubs, the participants don’t meet solely to critique and debate the points of their readings. Instead, they evaluate articles and research about teaching science and study broader teaching methods to incorporate into their teaching. Richard Wagner, a graduate employee in the Department of Physics, has been attending the journal club since it began. The journal club was started in 2010 by Elly Vandegrift, who currently serves as the associate director for the Science Literacy Program, and affiliated graduate students who wanted to learn more about science education research. For Samantha Hopkins, associate professor of earth sciences and associate dean for faculty in the Clark Honors College, the journal club has given her the opportunity to learn about current research in science teaching and has led her to incorporate more active learning into her courses. A critical part of the insights faculty members and graduate students gain from the journal club comes from undergraduate students sharing their perspective on the classroom learning experience. Ruimin Xia, a fourth-year undergraduate majoring in educational foundations, sees her role as a “bridge builder” between faculty members and students. Her experience in the journal club has reaffirmed her passion for education and the principles from her major coursework. Many of the undergraduate students who have attended the journal club have been surprised by the discussions and being able to talk with their instructors about how to improve the teaching and learning experience. For winter 2019, the journal club has been reading “Teaching Undergraduate Science: A Guide to Overcoming Obstacles to Student Learning” by Linda C. Hodges, which explores strategies for helping students learn science.